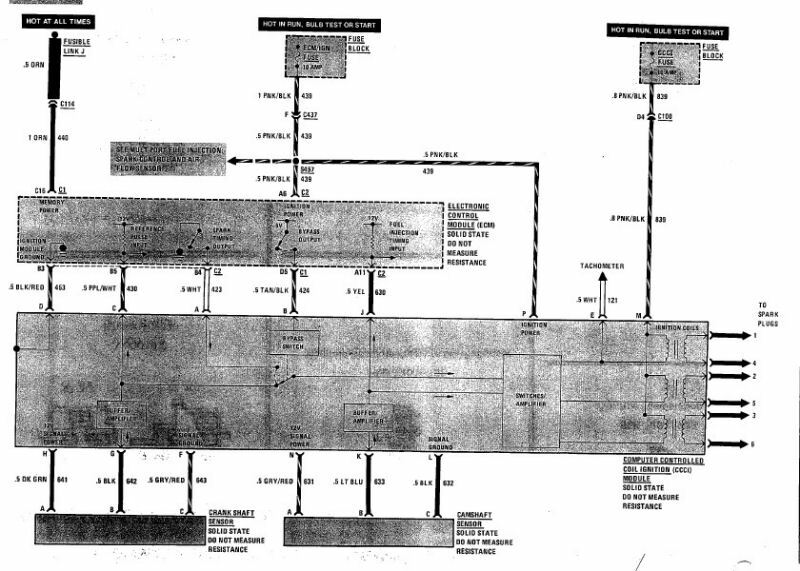 Below is the circuit diagram for the Type I Coil & Module normally used on our cars. There are three coils that fire six cylinders. The system is designated a waste spark system as each coil fires two cylinders when triggered. For example when cylinder #1 is being fired for ignition in that cylinder, cylinder #4 is also fired even though it is on the exhaust stroke at the time. The coil pack is mounted directly on top of the ignition module and is connected to the module by four wires which are concealed between the two. There is one blue wire coming out the top of the module with three terminals on it. This wire goes down one side of the coil pack bottom and connects to one terminal on each of the three coil units. There are three more wires that also come from the top of the module. The yellow/black wire connects to the other terminal on the coil pack that serves cylinders #1 & 4. The green/black wire connects to the other terminal on the coil pack that serves cylinders # 2 & 5. The blue/black wire connects to the other terminal on the coil pack that serves cylinders #3 & 6. Note that the coil packs are numbered on top beside each spark plug terminal. The number is small. 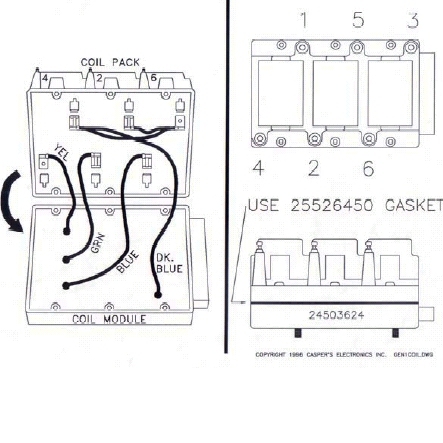 Normally, the odd numbered side of the coil packs are mounted on the module such that the odd numbers are closest to the firewall and the even numbers face the front of the car. As Cylinders #1 & 4 fire at the same time. It really does not matter if #1 is connected to cylinder #1 spark plug or the #4 plug, but, it's less confusing to follow the numbering convention. 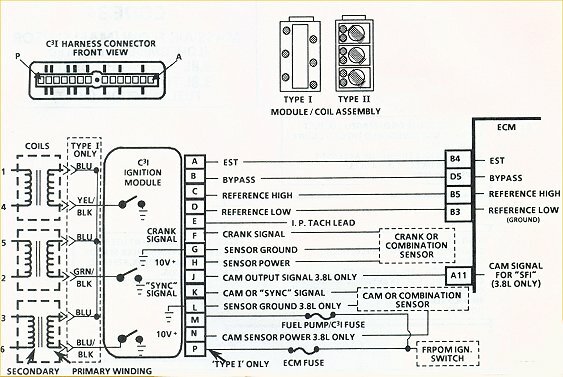 Note that most aftermarket modules don't work properly with our cars with many throwing a Code 42. Here is a drawing that I "borrowed" off Turbobuicks.com. Please note the owner of this picture is John Spina of Caspers Electronics. John is the guy to go to if you need electrical help for our cars as he has spent years developing products for them as well as supplying factory electricals.